Roller type: The up one surface is fluting and the down one surface is smooth. Tensile frame: mainly for assuring the constant winding speed under a certain degree of tension with some nonwovens. It is made of frame, 5 rollers and weight balance unit. This Produce line is filament polypropylene fiber spun bonded nonwoven fabrics equipment. 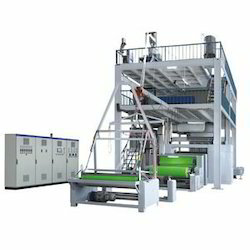 Its raw material is polypropylene (PP), take the principle of spinning man-made fibers, during polymer filature, continuous filament is extended into fiber net, which is finished by mechanical hot pressing, The machine assembly we adopt is now advanced veneer integer slot air flow draw technology, the whole process from material feeding to cloth output is automatic control, short production flow, high working efficiency. The nonwoven fabrics we produce has high strength, good softness, innocuity, bacterium-proof, corrosion resistance, high-level draw strength and elongation rate, They are widely used for dress, decoration materials, medical sanitation materials, daily life products and in the industrials, agriculture fields. In additional, this production line can produce nonwoven fabrics of different color, different grams,different lines according to users’ requirements. This machine is used for producing the non-woven fabrics film automatically. equality distribution of melt,balance pressure. of the temperature, no Hair-in-filling. Looking for Non Woven Fabric Making Machine ?